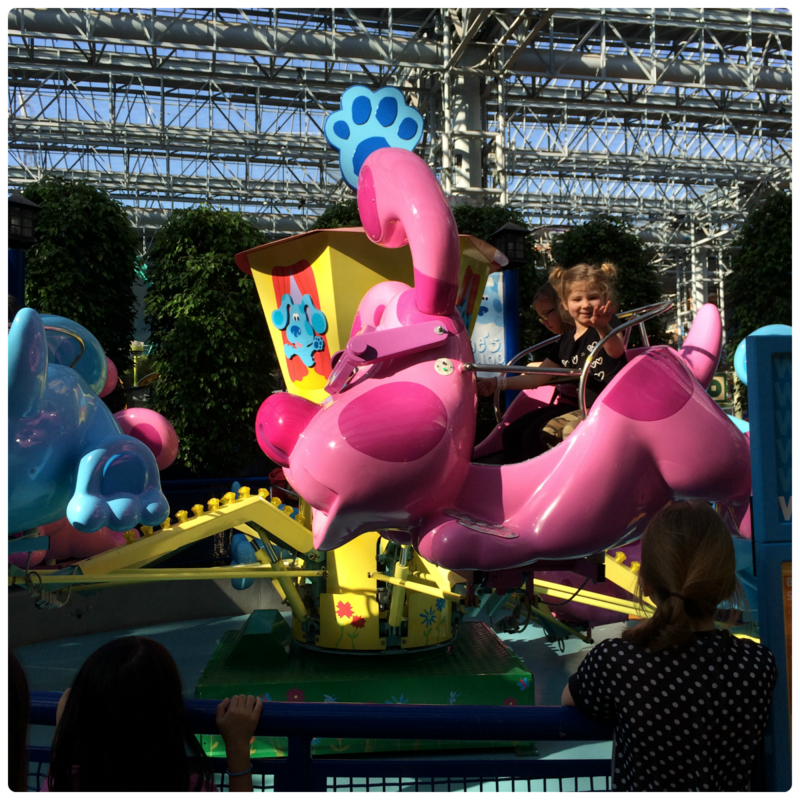 My sister and I first took her daughters to Minneapolis to the Mall of America in November 2013. The girls birthdays are in September, 6 days apart, and we planned on making it an annual tradition to take them on a birthday trip (one day it WILL be Disney - as much as I would have loved to be able to take them on their first airplane experience this trip that is completely out of the budget right now). Toni couldn't make her work schedule balance to do it during last Fall/beginning of Winter and it seemed like we wouldn't be able to do it at all for their 2014 birthdays. Then she realized that she had some days in April that she had to take off and she mentioned going to Minneapolis for their late birthday trip during those dates. I had just sent my passport away to be renewed though and it didn't look like we'd be able to make those days. Somehow my passport came in early (that never happens!) and so the plans starting taking shape. 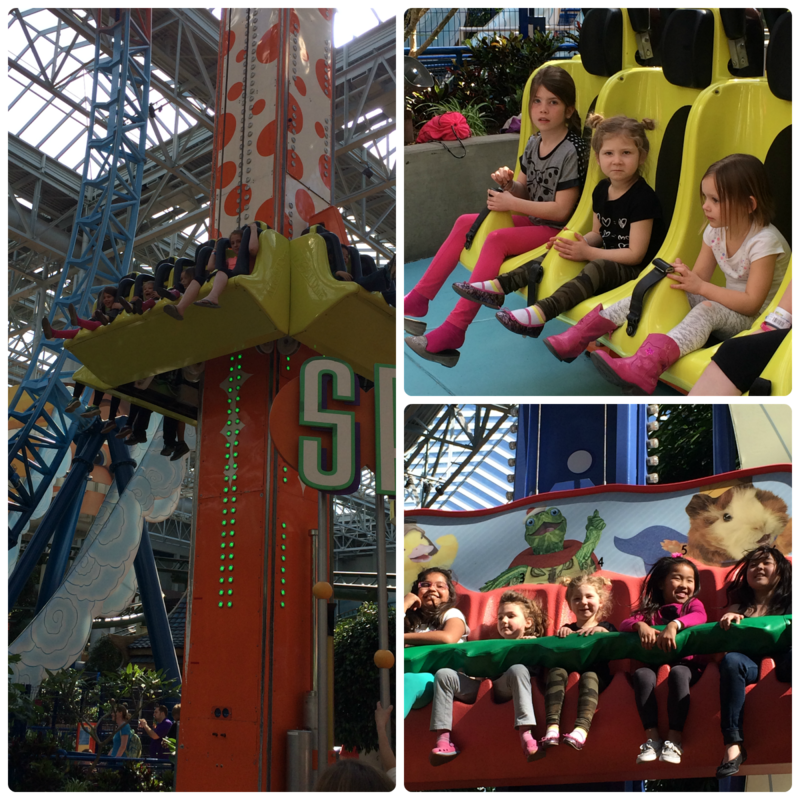 With Minneapolis only a 10 hour drive away from us its kind of a no brainer to take the girls there each year. 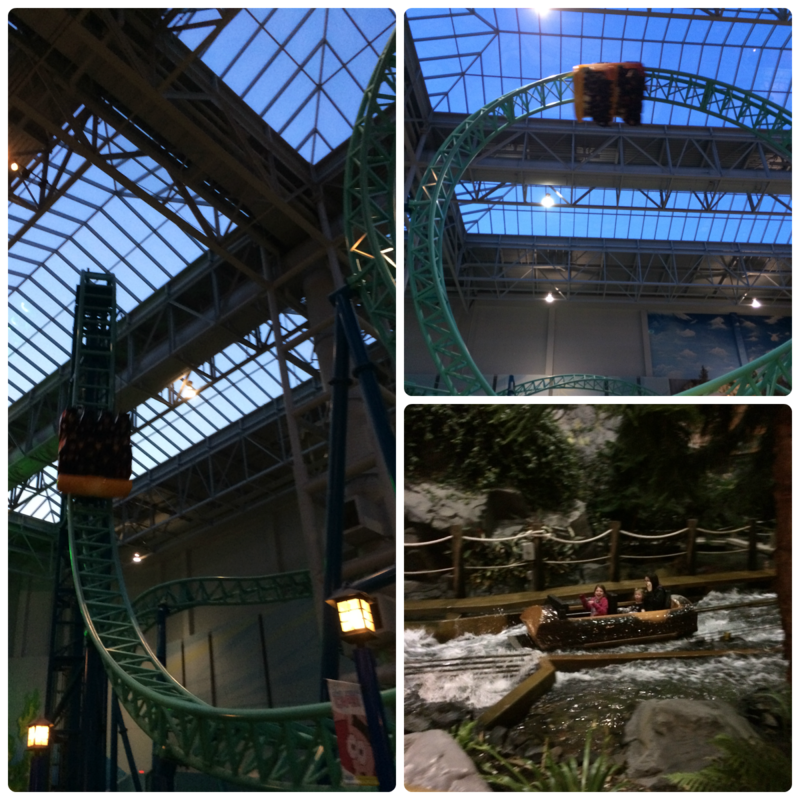 Even to take them to West Edmonton Mall is a longer drive (though we do have family there...) and they LOVED our first trip so much that they were begging us to go back again. The trip almost didn't happen because of a certain 4 year old's behaviour in the weeks leading up to the trip but she turned it around so we were still able to go. We left O-town around 6:00 on Friday night. Toni hadn't been able to get the Friday off of work, only the Monday, so we were short on time but wanted to get as far as we could on Friday. As mentioned in my Third Thursday Travel post for April, we didn't pay for a single hotel room during our stay, and we spent the first night in Moorhead, MN - a little over half way to Minneapolis. We got up the next morning and made the rest of the drive to Minneapolis. We settled into our hotel, and then caught the shuttle to head to the Mall of America. We were starving, we'd only had a little bit of breakfast at our hotels continental breakfast that morning, so our first stop was the Twin City Grill in the MOA. Their chips and guacamole and salt and vinegar fries are heavenly - if you are ever at the Mall of America I highly recommend this restaurant! After our lunch it was time for the rides. My nieces are daredevils and were always on rides that had waaay older kids on them. We had a supper reservation at Benihana's that night. I was first introducted to hibachi cooking while in Pennsylvania a few summers ago - we went to Benihana's for a friends birthday supper and I fell in love. When I found out last summer that there was a new location in the MOA I made the friends that were with me make a supper reservation - I would have went by myself if I had to! 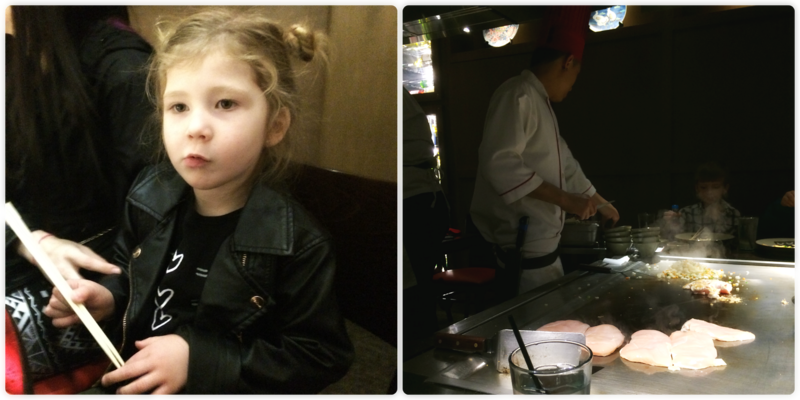 When Toni and I were planning the girls birthday trip eating at Benihana's was on the list for sure. We were seated with a nice local family that was out celebrating their son's 12th birthday. 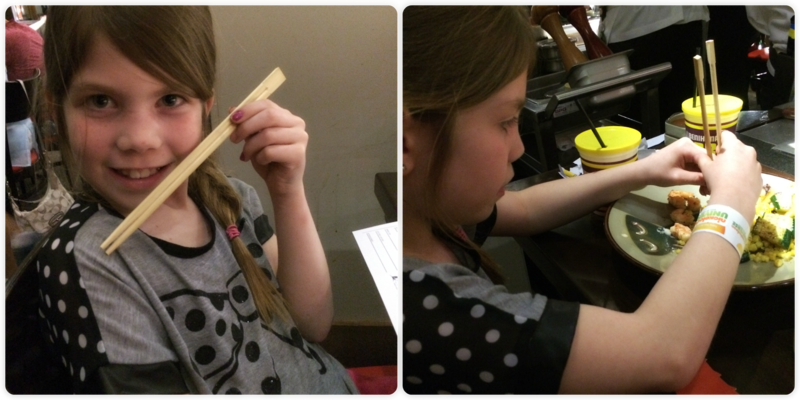 Audie-Rae was so interested in the chopsticks - she was determined to eat with them, not even touching her fork at all. Her Mom and I had none of that - we aren't cultured enough to not make fools of ourselves trying to use them. Graycie liked having the food cooked in front of us but was a little shy with sharing our 'table' with another family so she didn't eat much (though she told everybody afterwards that it was her favourite restaurant of the trip). After our supper we went back down to get the most of the girls wristbands to finish off their rides. Toni and I were suckered into going onto a few of the rides with them because Graycie was just a little bit too small to go without a chaperone on some of them. Luckily the adult chaperone doesn't have to pay for the ride but roller coasters are SO not my thing and I was co-erced into going on the roller coaster twice and the log ride once. She was the tiniest person on the roller coaster and it went soooo fast and I was so afraid she was going to fall right out of it. Again, roller coasters are not my thing! On Sunday we got up early and got ready to change hotels and head to the Waterpark of America, which is located in the Radisson, which was also where we stayed for our last night. The Waterpark is a little bit pricey but when you take into consideration the fact that you get 5 hours in it its not that bad. The funny thing is that Graycie would have been content just swimming in a regular hotel pool (which is free) - the girl is a fish and just wants to swim. The pirate ship play structure, waterslides, etc. didn't matter to her, it was all about swimming in the water. Audie-Rae the daredevil went on everything - Toni definitely got her moneys worth out of her! We left the Waterpark an hour before we had to - the MOA closes at 7 on Sunday so we had to get our butts in gear to get showered and ready to catch our shuttle to it. 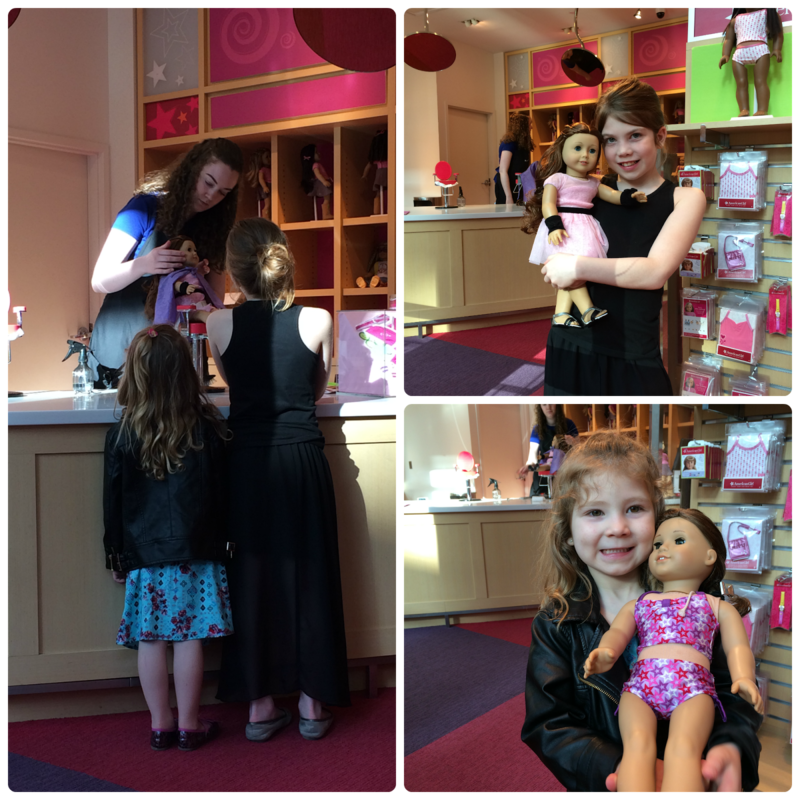 When we got there the first place we went was for a coffee at Starbucks and then to the American Girl store to get the girls American Girl dolls hair done - it was much needed, their dolls looked homeless befor their makeovers. After that we headed to the Disney Store so they could spend the last of their birthday money, and then it was time for the thing I was most looking forward to - Chipotle! 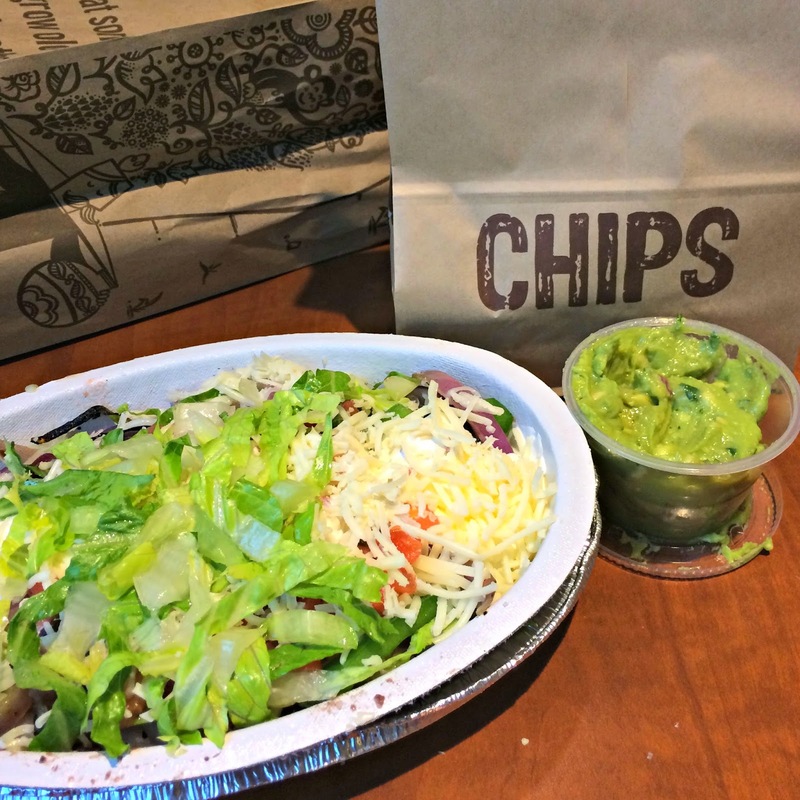 BUT I was mega disappointed when they were out of corn salsa. How does that happen?! It was a MEGA letdown. 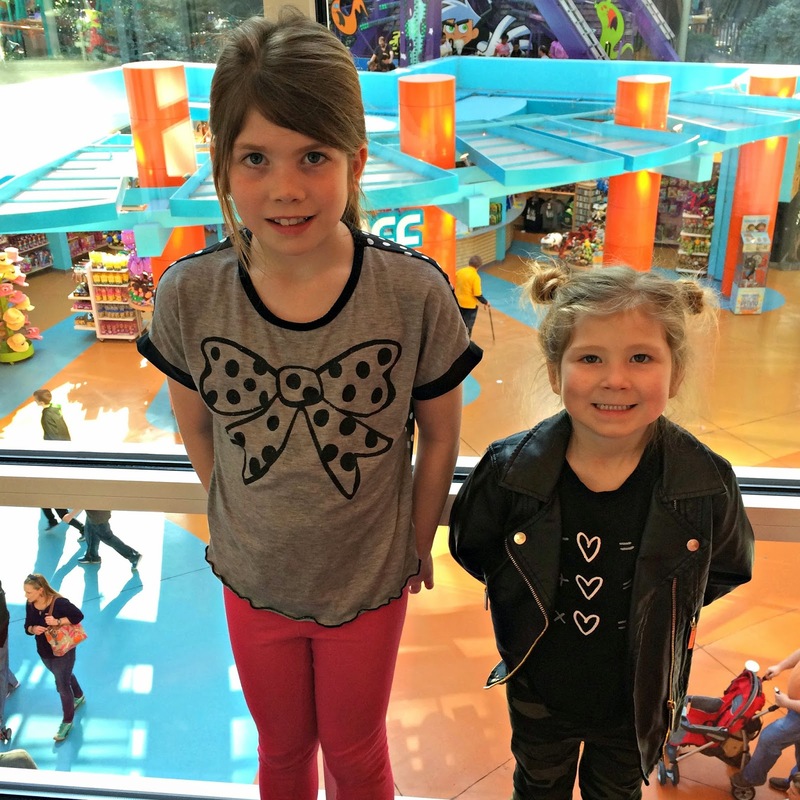 After Nickelodeon World, the Waterpark of America, and taking the girls to the American Girl store and to the Disney store there was no other time for shopping - not an issue at all though because I head back that way in just over 5 weeks to go to Blue Jays games with my brother and sister in law! The mall closed at 7 on Sunday night but the theatre was still open so we got tickets to see Cinderella since we didn't have any other plans for the night. The movie was actually really good and the girls enjoyed it. After the movie we got a taxi back to our hotel and the girls fell asleep as soon as their heads hit the pillow. Toni and I ordered pizza from our favourite MN pizza place - Toppers- and then settled in to watch the MTV Movie awards. How hilarious is Amy Schumer and how did I not know she existed until then?! We got up early on Monday morning to get out of the city and get on the road. We had plans to be able to stop in Minot and do some grocery shopping, make a trip to Target, and have supper but even the best laid plans go awry. 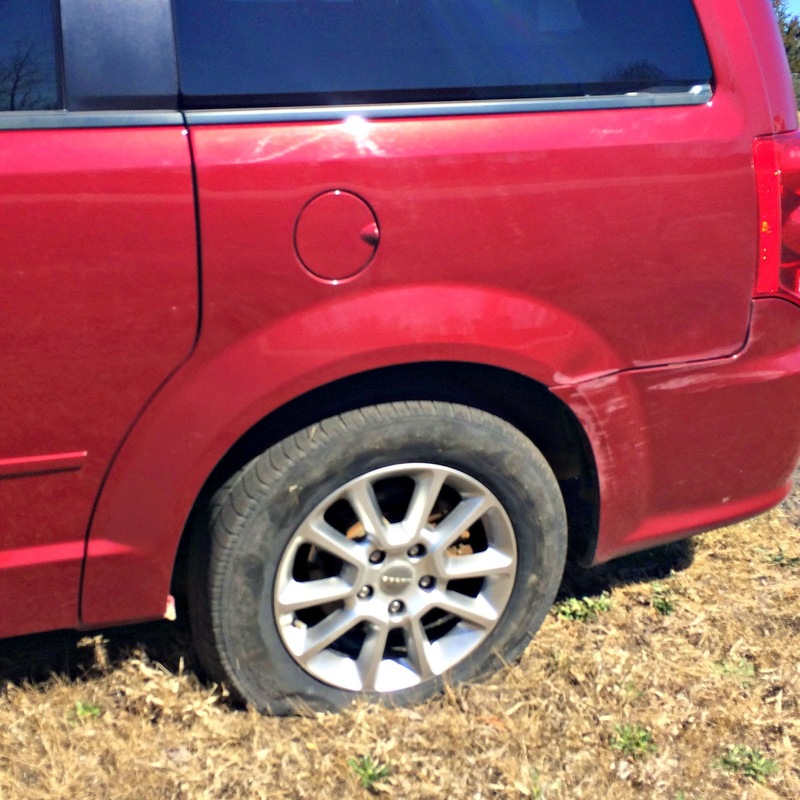 We were only about two hours out of Minneapolis when we hit a piece of metal laying in the middle of the interstate and blew a tire. After using the navigation in Toni's van to find the closest auto repair and trying to explain to the man on the phone where we were (and we couldn't look up our gps location on our iPhones because they only work for messaging and calls while we're in the states) and him having absolutely NO idea, a DOT worker finally stopped to help us out. Then a Conservation Officer and Highway Patrol stopped as well. After about an hour on the side of the road, and after a tow truck showed up (that the DOT had called), the three heros (the DOT officer had left after calling the tow truck) changed our tire so we could make it to the next town to a car dealership/autobody to see if they had a tire and rim. The Conservation Officer stuck around for over an hour at the dealership helping to try and find the right parts so we could get the van fixed and back on the road - he went above and beyond for us and we were SO thankful for him! We were at the car dealership for around 4 hours and we were more than ready to get back on the road by the time the van was fixed. Thankfully the dealership had a little area for the girls to play and they finally got us a loaner car at one point so we could go eat - we were starving! We finally got home around 2:00 am on Tuesday - 9 hours after our original estimated time. BUT it could have been much worse so we just have to be thankful for that. The repairs to Toni's van should be covered by insurance so it will hopefully all work out in the end. After three days with the tiny humans at the MOA and on the road I'm not sure if we'll attempt to actually make the trip this year around their actual birthdays (if we're brave enough too I should say) - making two trips in one year - or if they will always be behind in getting their birthday trips now. There were a couple moments during the trip that I was NEVER going back anywhere with them - but now that were back home and I don't have to spend every waking moment with them I'm thinking another trip will definitely be in the works! Oh my gosh what a fun trip! Minus the car trouble on the way home of course. I got to go the MOA for a few hours during a layover once when I was pretty young. I don't think we went on any rides though. It's on my bucket list to go back.